With production ending at George Gale and Company in Horndean, Bob Marvin (he’s the one in the middle) realized that a bit of brewing history could be lost. Marvin, head brewer at the Ringwood Brewery in Hampshire, worked at Gales until 1994, so got together with Ringwood managing director David Welsh and Gales’ retired head brewer Derek Lowe to strike the deal to get this 30-barrel fermenting vessel moved to Hampshire. After 159 years of beer production Gales taken over by Fullers in London last spring and production moved to the Fullers brewery in Chiswick. 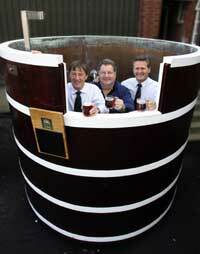 This vessel was used to brew the classic Gales Ales Prize Old Ale (9% abv). I hope that Fullers keep brewing Prize Old Ale. My father has me hooked already. He is trying to find some this year, but its proving tricky.